Our warm temperatures are ideal for mosquitos—but that doesn’t mean you have to let them have free reign of your property. 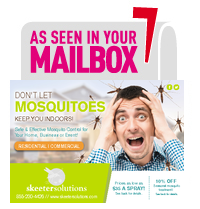 Whether you’ve got a yard that’s being overrun, a business whose customers are frequently bitten or animals that need protection from mosquito-borne illnesses, Skeeter Solutions can help. Using ecologically friendly pesticides that won’t harm humans or animals, Skeeter Solutions can create an effective mosquito misting system for your outdoor space. You and yours can enjoy around-the-clock protection from the diseases mosquitos carry, like West Nile virus and encephalitis, and start enjoying the outdoors again. It’s no fun to grill, swim or play in a yard that’s infested with mosquitos; it can even be hazardous to your health. Since mosquitos can pass illness and disease to humans and pets, it’s best to avoid contact with them altogether. Skeeter Solutions specializes in designing and installing custom mosquito misting systems in residential areas all over the Gulf Coast. From Gulf Shores and Orange Beach, Alabama to Biloxi, Mississippi and Mobile, Alabama including all the areas in-between, our highly experienced technicians can evaluate your property and create a comprehensive solution that meets your unique needs. Don’t let mosquitos chase away your customers and clients. 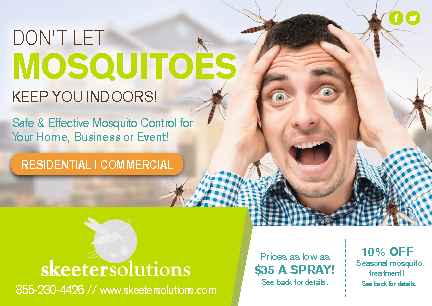 Whether you run an athletic complex, have a restaurant with outdoor seating or use any outdoor space as part of your business, Skeeter Solutions can keep mosquitos away so your customers can enjoy themselves on your property. You’ve spent time creating guest lists and sending out invitations—and the last thing you need is for mosquitos to crash your party. Skeeter Solutions can design a custom mosquito misting system for your special event; from weddings to graduation parties, our experts will help keep your guests safe from mosquito-borne illnesses and free to enjoy your special celebration. Your livestock and horses are at risk of mosquito-borne illnesses. The best way to protect them is to minimize their exposure to mosquitos. Skeeter Solutions can give your animals 24-hour-a-day, 7-day-a-week protection by installing a mosquito misting system that kills disease-carrying insects on the spot—before they can harm your animals. The active ingredients in our pesticides are derived from natural sources, and they’re safe for use around humans, pets and livestock. By having a mosquito misting system installed along your fences, near feeding areas and in your barns or stables, you’re giving your animals the best protection available against encephalitis and other mosquito-borne illnesses. Call Skeeter Solutions at (251) 279-0345 to find out how we can help you plan for summer barbecues, pool parties and other special events. Discover how we can keep your property mosquito-free all day, every day by talking to one of our highly trained technicians. We’ll set an appointment that works with your busy schedule and rid your property of annoying and potentially dangerous bugs right away.